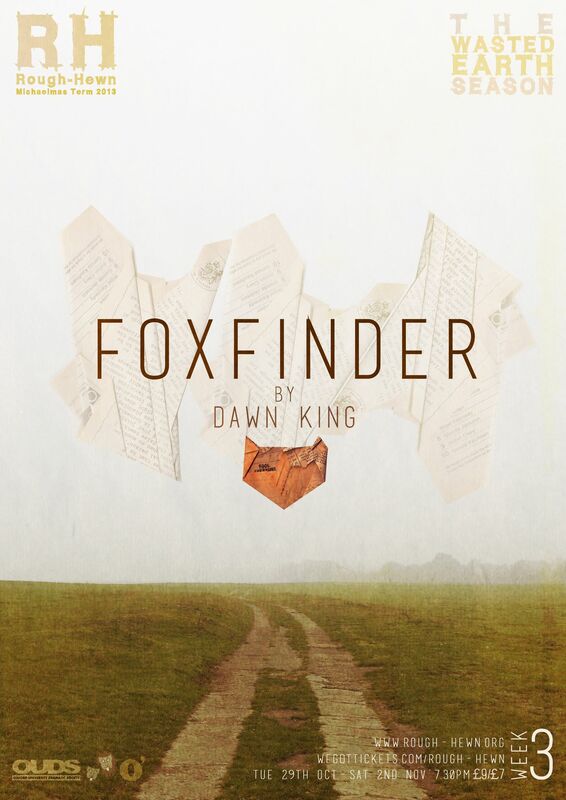 Full of desolation and unafraid to confront the darkest consequences of fear and grief, it is not difficult to see why Dawn King’s play Foxfinder won her the Papatango Theatre Company writing competition in 2011, ‘Most Promising Playwright’ at the Off West End Awards 2012, and placed her on the shortlists of two other major prizes for theatre writing. 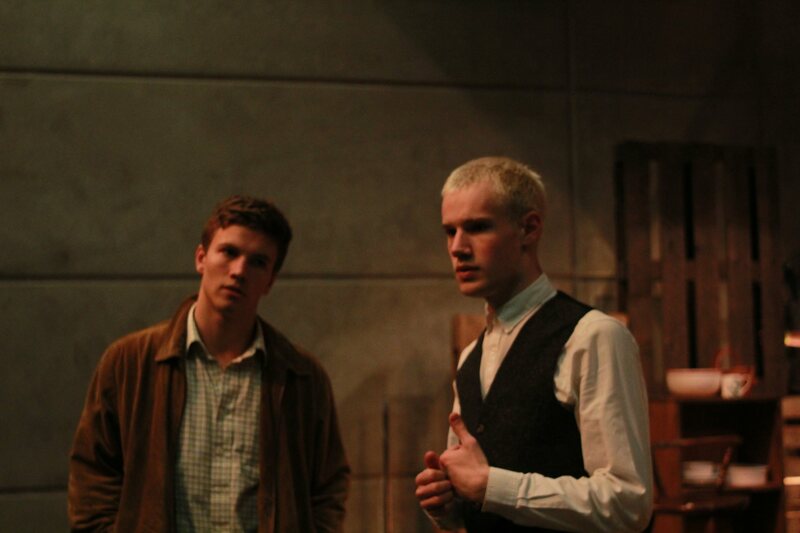 Rough-Hewn’s production provided a sensitive and arresting rendition, the intensity of the text accentuated by the intimacy of the Keble O’Reilly Theatre. The play is set on a British farm during a time of crop shortage and famine. The Foxes are believed to be the root cause of the problem, so when Samuel (Leo Suter) and Judith’s (Phoebe Hames) farm begins to fall under its quotas, the Foxfinder William Bloor (Nick Finerty) is sent to investigate. We are never informed of the identity of the Foxes, remaining as a symbolic presence throughout the play. They have been described by Michael Billington as “an attack on the danger of fundamentalist certainties”, and certainly Bloor’s eventual doubt as the foundations of his beliefs are shaken provides a horrific and disturbing climax to the proceedings. But they also represent a more universal danger in the tendency to search for a scapegoat rather than face up to one’s shortcomings be it on a personal or global level. Bloor announces that “History is watching us”, and indeed the spectre of history is present throughout the script: the attempt to shift blame in the face of government failure to halt crop shortages has echoes of the Great Chinese Famine; the culture of informants and propaganda driven by irrationalism conjures images of the Gestapo and the Third Reich; Bloor’s description of the Fox, with the ability to transform its appearance and influence the mind, has overtones of the Malleus Maleficarum, a 1486 treatise intended to prove the existence of witchcraft, and subsequently how to identify and persecute witches. Currents of superstition, paranoia, and manipulation accumulate throughout the play, and the pared down production provided a suitably claustrophobic atmosphere. With minimal props and staging, attention was fully focused upon the unfolding psychological drama. While some of the opening scene was difficult to hear, be it through the actors adjusting to the acoustic of the theatre or struggling with projection whilst maintaining a thick accent, the quality and conviction of the acting increased throughout as each character developed, resulting in a thoroughly gripping climax. Nick Finerty’s performance as William Bloor was outstanding, perfectly capturing the difficult balance of naivety, insecurity, and assumed authority that this character embodies. He rose well to the challenge of portraying the underlying sexual tension driving Bloor whilst remaining entirely human in his desires and anxieties, helped in part by the subtle humour lacing the script. Suter and Hames were convincing as a young couple suffering from the grief of a lost child and struggling under the pressure of living in a society of fear and self-denial, with strong support from Carla Kingham as Sarah, their family friend. Rough-Hewn have managed once again to fulfill their promise to “stage some of the most exciting plays to have been written this century … [and] have something to talk about on the way home.” Although some of the tension dipped a little in the first half, this darkly comic play is well worth seeking out. Foxfinder is running at the Keble O’Reilly Theatre until Saturday 2nd November at 7.30pm, with a 2.30pm Saturday matinee. Tickets are available from We Got Tickets, and for more information about Rough-Hewn and their upcoming productions please visit their website.